A team of University of Southern Queensland archaeologists have uncovered the oldest rock art to have been discovered in Australia in a remote Northern Territory shelter. Professor Bryce Barker, who was working with USQ researcher Dr Lara Lamb, found the charcoal drawn fragment dated at 28,000 years after excavating a small part of a massive rock shelter site named Narwala Gabarnmang. Bryce Barker, University of Southern Queensland archaeologist Bryce Barker investigates Aboriginal rock art in a cave in the Australian Outback. Prof. Barker said Monday, June 18, 2012 that tests show the Aboriginal rock art in the cave was made 28,000 years ago, making it the oldest in Australia and among the oldest in the world. Professor Barker and Dr Lamb (USQ), along with Professor Jean-Michel Geneste (Universite de Bordeaux) and Jean-Jacque Delannoy (Universite de Savoie) are partners in a major archaeological project ‘Connecting Country’ led by Dr Bruno David of Monash University in south western Arnhem Land in the Northern Territory. This project was requested from the Jawoyn Association, based in Katherine, who would like the sites of their ancestors, including the rock art, documented and investigated for what it can tell about the history of their culture. 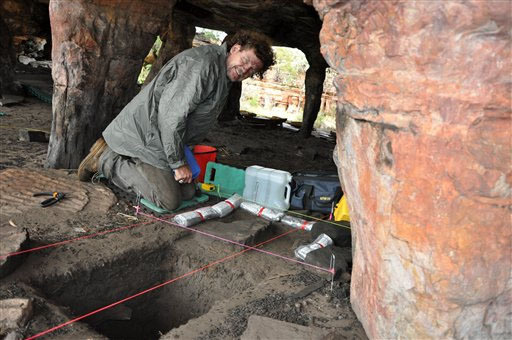 Through the project work researchers have learned that human occupation of the Narwala Gabarnmang site dates back to 45,000 years ago, making it one of the earliest human occupation sites in Australia. Professor Barker said the site also has evidence of the earliest human use of edge ground axes at 35,000 years ago — a stone tool technology not developed elsewhere in the world until much later. The Narwala Gabarnmang site is one of the richest Aboriginal rock art sites in Australia and one of the most extensive in the world. It has been described as the ‘Sistine Chapel of rock art sites’ due to the extensive coverings of art on the roof of the shelter. ‘Rock art is notoriously difficult to date and although we know that people had occupied this site at least 45,000 years ago we did not know how old the art was,’ Professor Barker said. However, in June, 2011, a remarkable discovery was made. Material excavated from Square E by Professor Barker and Dr Lamb was returned to the USQ archaeology laboratory for sorting and analysis. During this process, in October last year, Professor Barker turned over a fragment of granite stone and was stunned to find a piece of a charcoal drawing. The significance of this find was that it was in a layer deep down in the earliest levels of occupation, indicating a significant age. Additionally, because it was drawn in charcoal it meant the work could be accurately dated. A specialist dating team led by Dr Fiona Petchey from the University of Waikato radiocarbon laboratory took scrapings of the charcoal which subsequently turned out to date to 28,000 years ago, making it the oldest firmly dated rock art painting in Australia and amongst some of the earliest evidence of human painting in the world. The astonishing test results were delivered to Professor Barker only recently. ‘When I turned over that little piece of rock and saw that art I couldn’t believe it,’ he said. The Connecting Country project aims to present the Jawoyn community with renewed opportunities to engage with their own historical places at a time of rapid global change, where community-run cultural eco-tourism allows Jawoyn clans to renew connections with remote ancestral places, maintain the integrity of cultural sites through appropriate visitation and engagement, inform the world about Indigenous traditions in a culturally appropriate way, and to create community employment as an opportunity to ‘look after country’ – that is, to help maintain the health of ancestral places by continued visitation, engagement and the sharing of knowledge.